This is Paris 8:30am this morning from the apartment window. I was catching the news and heard about the snow in the UK, chuckling to myself how the whole infrastructure crumbles with just half a cm of the white stuff, let alone several centimeters, but then I drew back the curtains, and found the above. It’s still only 8:45am, and I’d love to run outdoors and start snapping up photographs of Paris in the snow (whilst it’s still pristine and white), but I’m waiting on an urgent package from Colissimo post (24/48 hour delivery). So far they’ve proven themselves dishonest and totally unreliable, and something I should have received during the middle of last week has still not arrived. Touch wood, they’ll deliver it soon (I hold my breath), and then I’ll run out to grab some more photographs to post – perhaps a stroll down to the Eiffel Tower, although I’m sure the snow’s already gone brown there! update : Despite the criticism I had for Royal Mail, La Poste is much worse, and has now cost me several hundred euros because of their inability to deliver on time. Alas, they’ve also lost my Paris in the snow photo opportunity as now it’s reached 12pm, the rain has come down and taken it all away. I think it’s going to be one of those weeks. Beautiful photo. Look forward to more. Though I doubt if I will ever see Paris first hand I love maps, photos, videos, and paintings of the city. I have dreamed of visiting it and wonder how close my dream is to actual places. As for snow, I lived in Montreal for ten years and got my fair share of it. Hi John. No traces of snow today (Tuesday) – Paris is often a few degrees warmer than the suburbs so doesn’t see snow very often, but this year is proving different. Hope you get to fulfil your dream one day, and that it lives up to expectations. 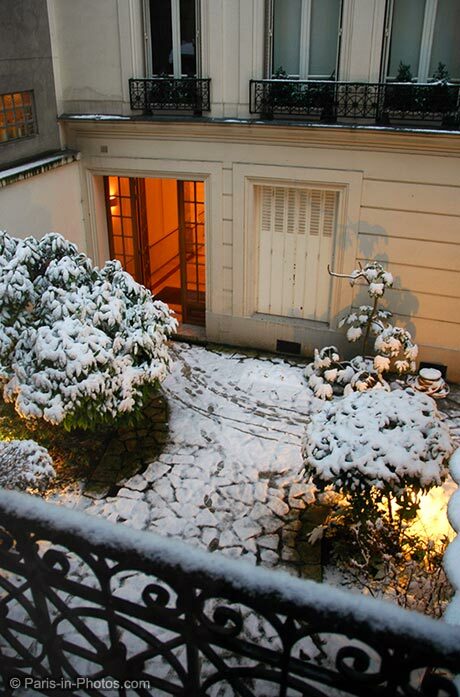 I LOVE it when it snows in Paris! On the 2nd of January I awoke to flakes floating down outside – It was the quickest I’ve ever donned on warm woollies and rushed out to see snow around the Eiffel Tower – JUST TO EXPERIENCE IT – then, I did the unthinkable, bought an espresso from Starbucks, a cupcake topped with PINK icing from the bakery further down the street and walked to Pont Alexandre where I stood and snacked – Ended up being cold and wet – but … so memorable! After that I headed to the Picasso exhibition totally exhilarated! My French cousin just can’t believe it! She dreads the weather I adore! (I escape Sydney in the summer for some REAL WEATHER!) lol! It doesn’t snow very often here unfortunately, and I was over in the UK on the 2nd of January so missed that spell. It remains pretty cold here in Paris, but so far, no more snow. I walked to the Eiffel Tower last weekend, and was surprised by the number of tourists there were for a cold February. Once upon a time I was in Paris working in Sorbonne, the University of Paris in the Qurtier Latin. Winter snow was beautiful when it was falling. After that when it melts, slushy and very ugly to look at. This photo brought my memory back to remember those wonderful days of my youth. Glad it brought back some memories for you – I only wish it had lasted long enough so I could have gone to the Latin Quarter to take more photographs. You have some beautiful photographs of India. Quelle magnifique ambiance et quelle belle lumière. If everything goes well I will be in Paris on December 24, 2009 together with my tour group from Medan, North Sumatra, Indonesia. If you do not mind we would like to know the whether condition during December and some body says it will be winter season in December. Is that absolutely correct ? and if yes what should we do to anticipate the winter season due to such condition never happen in our country. Looking forward to have your information and thanking you in advance for my friend who able to response my problem.